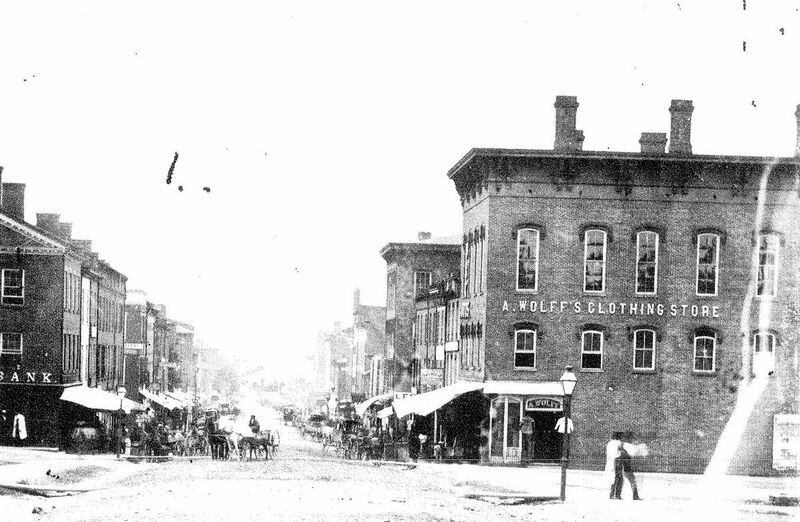 Downtown Mount Vernon, Ohio, looking down South Main Street from the Public Square, early 1870s. Adolph Wolff’s Clothing Store dominates the corner. Researchers of “the first Jewish family in [whatever town]” know that as soon as you think you have discovered that first family, you will run across a new name or a reference that casts doubt upon the title. That said, there has been a Jewish presence in Knox County since the winter of 1846-1847, when Adolph Wolff, his wife Hannah, and their two children settled in Mount Vernon. The story of Jewish migration into Knox County follows the history of Jewish immigration into the United States. German Jews arrived in the mid-nineteenth century, to be followed by Russian Jews at the turn of the last century. The Jewish population has waxed and waned throughout the decades, dependent upon immigration, the advent of new industries and businesses that brought in Jewish families, and then decline occasioned by deaths, retirements, and migration to urban areas. Jewish families have been part of the life of Knox County for over 150 years. Here are their stories.